This recipe serves 2 with leftovers. If we were serving four, we would increase the chopped greens to four cups (one cup per serving). Cover 1 lb. dry lentils with an inch or so of water in a heavy guage 6 quart saucepan. Turn heat to medium and cook with cover on until tender, 30 minutes or so. Keep an eye on the water level and add more if needed so lentils don't burn. Cut 1 lb. stew lamb into `3/4" cubes and add to saute-ing onions. Cook, covered, turning occasionally, adjusting heat so the skillet doesn't burn (onions release sugars that can quickly carmelize then burn if you don't keep an eye on things). 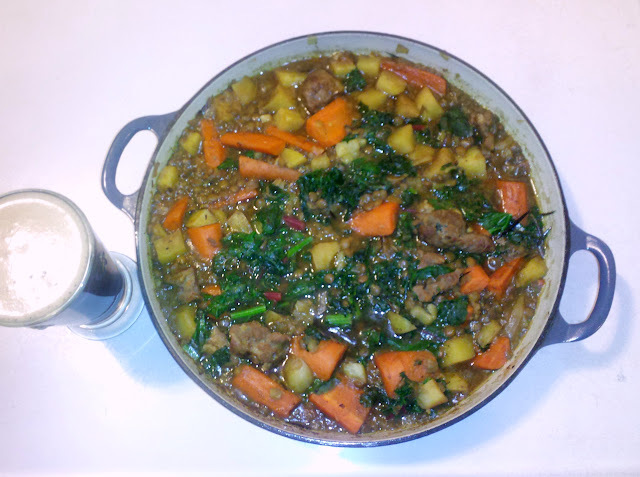 As lamb releases juices, add 4 cloves minced garlic, saute garlic for a minute or so and add 1/2 cup Guinness Stout. Stir and cover. While lamb is cooking, dice 4 medium potatoes (we love waxy potatoes like Yukon Gold). Set aside and peel 4 large carrots, halve and cut into 1 1/2" lengths. When lamb is tender, add potatoes and carrots to lamb. Set 2 large sprigs fresh rosemary (dry rosemary is ok if that's what you have) on top of meat and vegetables, turn heat down to simmer and cook until potatoes and carrots are tender. Check lentils (they're probably done by now) and add water from lentils to skillet if more liquid is needed. While skillet is simmering, wash and chop 2 packed cups leafy greens (chard and/or kale). When potatoes and carrots are tender, add half of the cooked lentils (with broth) to skillet. Stir in a teaspoonful honey and season to taste with sea salt and fresh ground black pepper. Place chopped greens on top of stew and cover. Cook until greens are tender and bright green (don't over-cook). Serve all cooked greens with the stew at the first meal. Add the other half of the lentils to the leftovers to be served the next day or so or frozen for a future meal. Add fresh chopped greens when heating up the leftovers for another meal.